The beginning of the school year is a great time to share books about the importance of books and libraries. A new nonfiction picture book by Dial Books would make an excellent read aloud to stimulate discussions with children about the importance of books and libraries to our society. 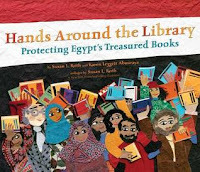 In January 2011, when protesters took to the streets of Egypt and started an uprising against the government, librarians at the Alexandra Library were concerned. Would protestors harm the library? Susan L. Roth and Karenn Leggett Abouraya capture the emotion of the events in Hands Around the Library: Protecting Egypt's Treasured Books. The narrative is written in the first-person from the point of view of a librarian taking part in the protests. "In other parts of our city some of the protestors had acted in anger. They had set fire to cars and to a police station. As we marched toward the library, I grew worried. What if they tried to burn it down?" Alexandria has a rich, library history. Ptolemy used the Alexandria library to collect knowledge from around the world until it was destroyed by fire in 48 B.C. The modern library of Alexandria is a huge, modern building made of eleven floors in the shape of a circle which "represents the sun shining on the world." As protestors made their way through the streets of Alexandria, library director Dr. Ismail Serageldin persuaded citizens to protect the library by joining hands in front of the library. Roth's paper and fabric collages are an ideal medium for relating a serious story to young readers. A two-page spread shows the the protestors from behind as they stand outside the Alexandria library. On some pages, Roth frames smaller illustrations to look like a series of photographs. My favorite page-turn in the book is when the library director is holding hands with people in front of the library. The next two-page spread uses paper and cloth to illustrate hands holding the red, white and black flag of Egypt. Readers will be interested in the photographs in the back of the book that show the Alexandia Library with a human chain protecting it from harm. One photograph shows the oversized Egyptian flag being held in the streets in front of the library. Back matter includes information about the ancient library of Alexandria and Alexandria's modern library. A note from Susan L. Roth describes how she became interested in the Alexandria Library after her friend (and co-author), Karen Leggett Abouraya, married a man from Egypt. Roth visited the Alexandra Library in 2009. Picture books are an excellent way to relate heavy subjects to students in a manner they will understand, and there are many powerful messages that young readers may take away from this story. Pair this book with The Librarian of Basra by Jeannette Winter. Oh this is lovely, we have a kin-post today, as I have just done a 4-in-1 review of books that talk about libraries and great librarians! I will look for this book and hopefully I can add it to our featured books for our current bimonthly theme on "Dusty Bookshelves and Library Loot." I have long appreciated & shared when I read in schools, The Librarian of Bassra by Jeannette Winters. Thank you for bringing this new one to good attention. I much look forward to reading the Susan Roth & Karen Leggett Abouraya book on this important community effort, which I'm sure is ongoing. I feel it adds heft to their topic that the co-authors have this personal connection in visits &/or family heritage. Most important - brava to the brave people of Alexandria. Previously a couple of years back I had enjoyed visiting the website of this wonderful modern library that protects these world treasures. Brava, brava.